What is the Best Chomebook for My Kid in 2017? Home → Laptop Advice → What is the Best Chomebook for My Kid in 2017? Every day parents ask us for laptop advice. 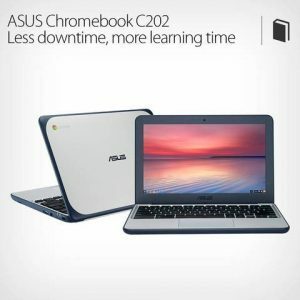 More and more parents are also turning to Chromebooks. When looking for a laptop or Chromebook for children most of us want to know how much it is going to cost and if it is going to meet our kid’s needs or not. need something durable so we don’t have to buy it a second time. Many parents are turning to Chromebooks because they do not get viruses like Windows machines and the batteries last 10+ hours instead of 2. Also, they’re under $300. While some laptops can be had under $300 they are going to break if you look at them wrong. A good laptop still costs $800 and there are ThinkPads and MacBooks on the market in the $2,000 – $3,000 range, even in 2017. Whether it is for playing simple games, loading apps, or doing homework, there are 2 great units we have picked out at Amazon which will meet almost any kid’s needs. Note, these are popular machines, and are sold BY Amazon and ship FROM Amazon- no third party stuff here. This is the “C202SA-YS02” model and is specifically designed for students and is great for any kid. This unit is dark blue. It has no moving parts in it at all so it is quiet and will last quite a long time. At the time of this article it has nearly (400) reviews and 4.5 out of 5 stars. This is also a great unit for students. This unit has an Intel N3060 CPU, 4GB RAM, 16GB solid state drive, webcam, SD card reader, USB 3.0, HDMI port, HD webcam and has a water resistant keyboard. The battery also lasts about 10 hours, more than enough time to get through the school day. These units are stylish without too much bling, and they’re a huge upgrade, often only around $279 delivered. If you have a teenager or a kid over the age of 9 you may want to spend a few bucks extra and get this unit which comes in both gold or silver. These have a 14″ HD screen and your kids will get a ton of use out of them by watching movies & doing school work. 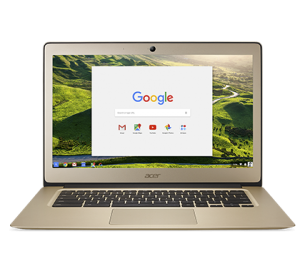 Acer has been building Chromebooks for quite a while now, too. These have a fast, quad core Intel N3160 processor, 4GB RAM, and a 32GB drive. The battery lasts 12 hours. These units are 3.4 pounds and have very nice HD displays. All depends if your kid is an expert or not.